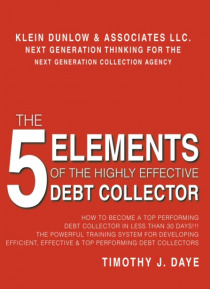 The 5 Elements of the Highly Effective Debt Collector is the first How to collect a debt book of its kind, in that it breaks the debt collecting process down into five core fundamental areas. After years of training in the collection industry, I have found that these five fundamental areas are at the center of revealing the mystery behind why only a small percentage of debt collectors produce at … a high level and more importantly explains why the larger percentage of low to mediocre performers never reach a top producing level. Not only does this book establish fundamental concepts every debt collector must understand to maximize personal or agencys earning potential, it also teaches: sound principles of engagement, valuable communication concepts, effective sales rebuttal techniques, as well as a system of file management that if followed and executed properly will more than double a collectors efficiency and effectiveness in less than 30 days The 5 Elements principles and concepts were designs to ensure that no matter an individuals talent level, years in the industry, or position held within an agency, the end user will understand clearly and be enriched by the experience.